Thousands of veterinarians gathered Monday in Incheon, west of Seoul, to discuss ways to enhance the health of humans, animals and the environment around the world. 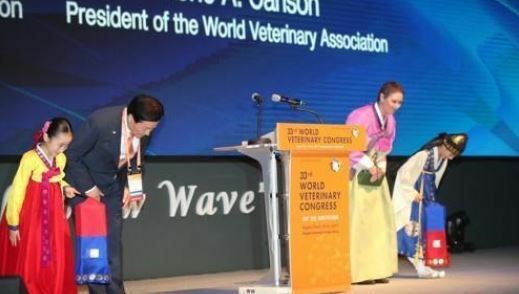 In a speech opening the 33rd World Veterinary Congress earlier in the day, South Korean Prime Minister Lee Nak-yon said, "The congress will become an opportunity for mankind to strengthen measures to cope with livestock diseases that are affecting human health." Also attending the opening ceremony of the four-day congress were Agriculture Minister Kim Yung-rok, former UN Secretary-General Ban Ki-moon, Incheon Mayor Yoo Jeong-bok and Korean Veterinary Medical Association chief Kim Ok-kyung, who serves as the congress chief. Themed "One Health, New Wave," the congress is expected to bring together about 5,000 experts from 80 countries who will share new technologies in all disciplines of clinical veterinary medicine and creating a new trend in the field. During the congress, the participants are expected to discuss ways to improve international cooperation in fighting against outbreaks of livestock diseases including bird influenza, an infectious disease of animals that can be transmitted to humans, and foot-and-mouth disease, a viral disease that affects cloven-hoofed animals. At the end of the congress, the veterinarians will adopt the Incheon Declaration on their role and ethics and come up with a vision that sets the direction of the veterinary industry by 2050. The congress, which was founded in Germany in 1863 and often touted as the sector's Olympics, was held 32 times over the past 154 years.